With markets becoming less predictable, investors need a clear understanding of the features and risks of their investments – especially their alternative investments – to help them best manage their portfolios. When it comes to market volatility, 2017 was the calm before the storm. We said goodbye to historically low levels of volatility in the very first quarter of 2018 as markets experienced rising turbulence. This resulted from a convergence of factors, including increasing global trade tensions, profit taking in technology stocks and a dampened outlook for global growth. The rise in volatility is sparking investor uncertainty and increased focus on diversification. Investors are looking beyond traditional stocks and bonds for alternative sources of return. One place they’re turning is to liquid alternatives. Liquid alts are designed to offer alternative sources of returns, low volatility and low correlation to traditional equity and fixed income markets through structures that provide daily liquidity, such as mutual funds and exchange-traded funds. As liquid alts continue to gain momentum, the need for information about alternative investment strategies, structures, underlying assets, fees and related details is escalating. As a result, transparency has become the top consideration for many investors when analyzing investment options and reviewing portfolio allocations. Institutional and retail investors have long sought transparency when making investment decisions and monitoring their investments. But the 2008 financial crisis moved transparency from a “nice to have” to a necessity. The crisis shined a spotlight on the extremely high levels of opaqueness of many investment products. This opacity hampered investors’ ability to gauge or communicate their portfolio exposures with sufficient assurance or speed, preventing them from exiting investment positions without excessive losses. Following the financial crisis, pensions, endowments, foundations and other institutional investors vowed to ascribe transparency a top slot among their criteria for investment decision making, as did the broader investing public. Over the last decade, demand for greater levels of transparency continued across investor types, strategy categories (traditional and alternative) and geographies. 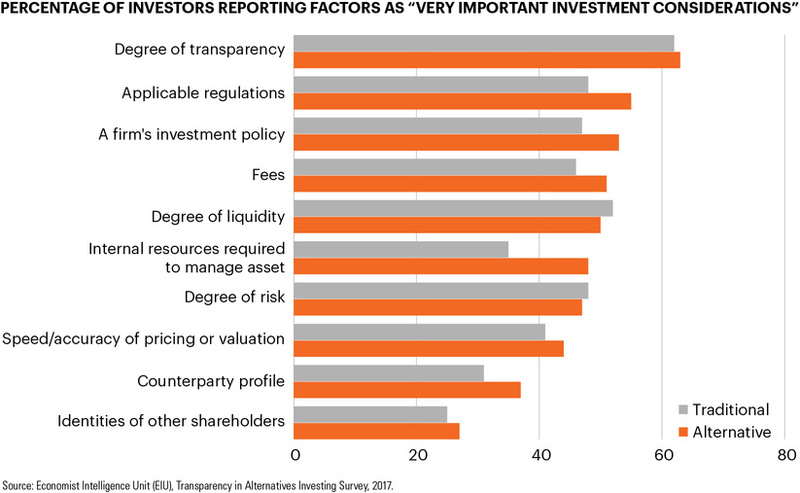 Today, as the chart below illustrates, investors report transparency as the most important investment consideration. Liquid alternatives offer heightened levels of transparency to precisely convey the details of the investment and to offer investor protections in compliance with regulations. Transparency is intrinsic to investor education as it is paramount for investors’ understanding and analysis of their investment choices. As such, it remains a core tenet underlying investor education, due diligence, selection, asset allocation and post-investment monitoring of liquid alternatives. Transparency allows investors to understand whether an alternative investment strategy appropriately matches the liquidity or other key characteristics of its structure. Likewise, it enables investors to determine optimal allocations within a portfolio, when to buy and sell the investment, whether the manager meets criteria imposed through effective due diligence, and how the fund is performing. Alternative mutual funds are governed by the Investment Company Act of 1940 (the ’40 Act). The ’40 Act laid the foundation for the governance and transparency of the modern mutual fund and established requirements for mutual fund transparency for investors. One requirement is that mutual funds must file a prospectus and statement of additional information, which disclose a fund’s structure, strategy, fees, financial condition, investment policies, risks, management team and other details for investors. Further, a mutual fund’s annual and semi-annual reports are readily accessible to investors. These and other regulatory filings and materials are available free of charge through the SEC’s online EDGAR database, a fund’s website or both. Likewise, the publication of a fund’s holdings, daily NAV, historical performance and expense ratios adds to its transparency and keeps investors educated and informed. The ’40 Act’s regulations are designed to ensure that conflicts of interest are minimized, investors are informed and funds are being managed in the best interests of shareholders. There is a plethora of resources where investors can access clear, detailed information about current and prospective liquid alts. Certain transparency requirements stem from the regulation of mutual funds generally, while others flow from fund company policies, practices and managers. The table below provides some notable resources that are indispensable for the due diligence of potential allocations and for monitoring existing investments. Given the lessons learned from the financial crisis and the turmoil that preceded and followed it, it’s no surprise investors covet transparency more than ever. This is especially true for those considering liquid alternatives, which are typically more complex than traditional investments. Access to alternatives has expanded greatly in the last decade, but so has the number of transparency resources available. Making use of them is essential for investors to decide which ones best fit their portfolios and to monitor their investments going forward.